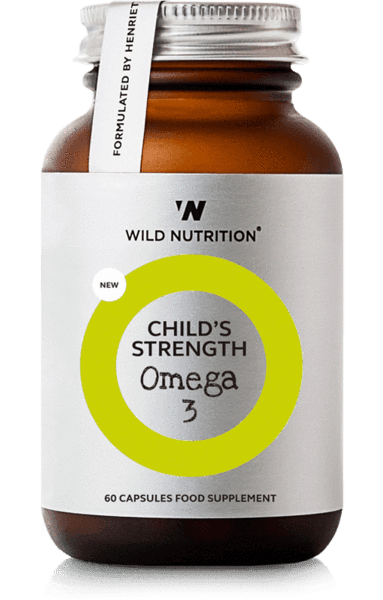 Uniquely formulated for men, a complex of Food-Grown® vitamins, minerals and herbs for optimum vitality for key areas of health such as immunity, energy, a demanding lifestyle and sports recovery. 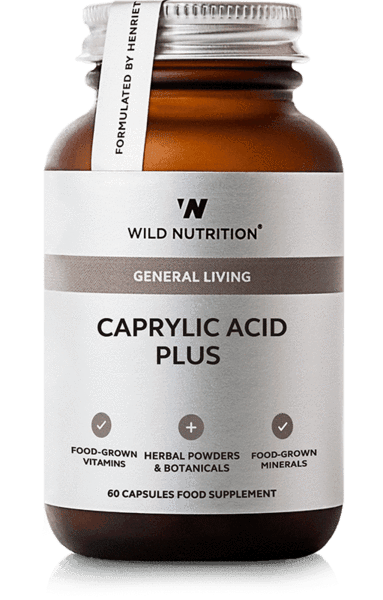 Antioxidants support defence against oxidative stress from daily wear and tear and Cordyceps and Reishi mushroom offer natural reinforcement during times of pressure. 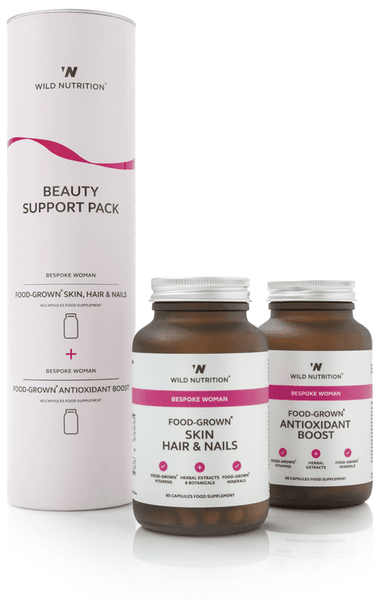 Wild Nutrition’s Food-Grown® Daily Multi Nutrient for men is a comprehensive blend of highly bio-available Food-Grown® nutrients, amino acids and CoEnzyme Q10. This bespoke formula has been expertly developed for men who want to maintain optimum vitality and support important areas of health such as immune health, energy and sports recovery. Key ingredients include; Vitamins B2, B3, B12 and Vitamin C for the reduction of tiredness and fatigue, normal function of the nervous and immune system pre- and post-exercise, healthy psychological function and the maintenance of normal skin; Vitamin E, Zinc and Manganese are included for their contributory role in the protection against oxidative stress. Oxidative stress is a result of ‘free radical damage’ produced from lifestyle factors including stress, environmental pollutants, alcohol, cigarette smoke, poor diet and high levels of exercise. Vitamin C incorporated in citrus pulp; Beta-Carotene incorporated in Carrot concentrate; Mineral enhanced Yeast providing Thiamin, Riboflavin, Vitamin B6, Vitamin B12, Vitamin E, Biotin, Inositol, Vitamin D3, Niacin, Pantothenic Acid, GTF Chromium, Pro-Natured CoEnzyme Q10, L-Methionine; Lactobacillus bulgaricus providing Magnesium, Copper, Manganese, Selenium, Zinc, Molybdenum, Iron, Iodine and Calcium; Folic Acid (as naturally occurring Folate) and Vitamin K incorporated in Alfalfa concentrate; Alpha Lipoic Acid, Cordyceps Sinensis powder and Reishi mushroom powder. Vegetable Cellulose (capsule shell). If you taking medication or under medical supervision, please consult your healthcare practitioner before taking any food supplement. We advise taking your supplements a minimum of 2 hours from the time of taking any medication. Store in a cool, dry place away from direct sunlight. Keep out of reach of children. Food supplements are not to be used as a substitute for a balanced diet and healthy lifestyle. 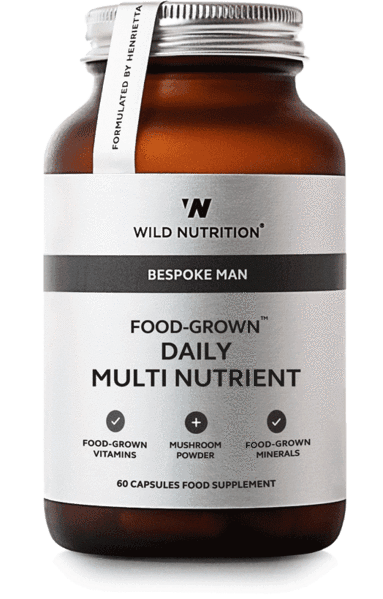 Wild Nutrition’s Food-Grown® Daily Multi Nutrient for men is a comprehensive blend of highly bio-available Food-Grown® nutrients, amino acids and CoEnzyme Q10. This bespoke formula has been expertly developed for men who want to maintain optimum vitality and support important areas of health such as immune health, energy and sports recovery. 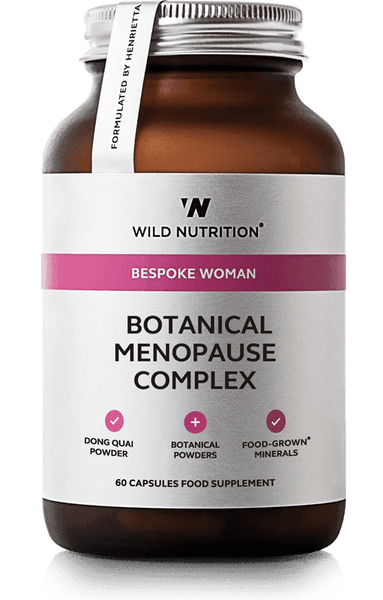 Key ingredients include; Vitamins B2, B3, B12 and Vitamin C for the reduction of tiredness and fatigue, normal function of the nervous and immune system pre- and post-exercise, healthy psychological function and the maintenance of normal skin. Vitamin E, Zinc and Manganese are included for their contributory role in the protection against oxidative stress. Oxidative stress is a result of ‘free radical damage’ produced from lifestyle factors including stress, environmental pollutants, alcohol, cigarette smoke, poor diet and high levels of exercise. Ingredients: Vitamin C incorporated in citrus pulp; Beta-Carotene incorporated in Carrot concentrate; Mineral enhanced Yeast providing Thiamin, Riboflavin, Vitamin B6, Vitamin B12, Vitamin E, Biotin, Inositol, Vitamin D3, Niacin, Pantothenic Acid, GTF Chromium, Potassium, Pro-Natured CoEnzyme Q10, L-Methionine; Lactobacillus bulgaricus providing Magnesium, Copper, Manganese, Selenium, Zinc, Molybdenum, Iron, Iodine and Calcium; Folic Acid (as naturally occurring Folate) and Vitamin K incorporated in Alfalfa concentrate; Alpha Lipoic Acid, Cordyceps Sinensis powder and Reishi mushroom powder. Vegetable Cellulose (capsule shell).